California Gull: Ralph Hocken Photo. The Sunday bird walk went to Buttertubs Marsh in Nanaimo. The morning was cloudy with rain showers and a strong cold wind. The highlights included seeing Marsh Wrens and hearing a Virginia Rail. We saw Hairy and Downy Woodpeckers feeding on the trees. A flock of eight Cedar Waxwings were perched on top of a Hawthorne Bush. Pied - billed Grebes and Gadwall were spotted on the water. Canada Goose, Great Blue Heron, Mallard, Bufflehead, Gadwall, Hooded Merganser, Ring-necked Duck, Pied-billed Grebe, Wood Duck, American Coot, Virginia Rail, Bald Eagle, Glaucous-winged Gull, California Quail, Rock Pigeon, Eurasian-collared Dove, Northern Flicker, Pileated Woodpecker, Hairy Woodpecker, Downy Woodpecker, Common Raven, Northwestern Crow, Chestnut-backed Chickadee, Brown Creeper, Bewick's Wren, Marsh Wren, Golden-crowned Kinglet, Ruby-crowned Kinglet, Anna's Hummingbird, American Robin, Cedar Waxwing, Varied Thrush, European Starling, Red-winged Blackbird, Spotted Towhee, Song Sparrow, Fox Sparrow, Golden-crowned Sparrow, House Finch, Dark-eyed Junco, Pine Siskins and House Sparrows. Over Forty Surf Scoters were seen in Departure Bay near the Ferry Terminal in Nanaimo. The Citrine Wagtail has been seen again in Courtenay on February 21. A Northern Shrike was seen in a backyard in the 2700 block of Neyland Road in Nanaimo. The Tuesday bird walk went to the Victoria Quay and Somass Estuary in Port Alberni. The morning started out cloudy but soon turned sunny and warm. The highlight of the morning was great views of five Yellow-rumped Warblers fly catching along the Somass Estuary. A large flock of Lesser Scaup and Ring-necked Ducks were on the sewage ponds. We saw a Northern Shrike four different times during the morning. Two Western Grebe greeted us on the Alberni Inlet at the end of the walk. The Tuesday morning birders would like to say a special thanks to Sandy McRuer for guiding us--it turned out to be a marvelous morning of birding! Trumpeter Swan, Canada Goose, Gadwall, American Wigeon, Mallard, Northern Shoveler, Northern Pintail, Green-winged Teal, Ring-necked Duck, Greater Scaup, Lesser Scaup, Surf Scoter, Black Scoter, Bufflehead, Common Goldeneye, Hooded Merganser, Common Merganser, Red-breasted Merganser, Common Loon, Pied-billed Grebe, Horned Grebe, Western Grebe, Double-crested Cormorant, Pelagic Cormorant, Great Blue Heron, Bald Eagle, Merlin, Red-tailed Hawk, Northern Shrike, American Coot, Virginia Rail, Mew Gull, Thayer's Gull, Western Gull, Herring Gull, Glaucous-winged Gull, Rock Pigeon, Belted Kingfisher, Northwestern Crow, Common Raven, Chestnut-backed Chickadee, Bewick's Wren, Marsh Wren, Pacific Wren, Ruby-crowned Kinglet, American Robin, Yellow-rumped Warbler, Song Sparrow, Spotted Towhee, Red-winged Blackbird, House Finch, Red Crossbill and Pine Siskin. Arrowsmith Naturalists will meet at 7.30pm at Knox United Church in Parksville. "Forage Fish" All are welcome. For more info phone 250-752-7588. 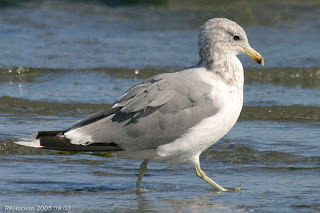 The Tuesday bird walk on February 26, 2013 will be going to the Shelly Road side of the Englishman River in Parksville. We will meet at Parksville Bay at the Lion's Playground parking area in Parksville at 9:00 a.m. or at the end of Shelly Road on the ocean side of highway 19a in Parksville at about 9:10 a.m. The Sunday Bird Walk on March 03, 2013, will be going to the Nanaimo River Estuary in Nanaimo. We will meet at the bird store at 9:00 a.m. or at the parking area at end of Raines Road in Nanaimo at about 9:30 A.M. Lesser Scaup: Ralph Hocken Photo. The Tuesday bird walk went to the Victoria Quay and Somass Estuary in Port Alberni. The morning started out cloudy but soon turned sunny and warm. The highlight of the morning was great views of five Yellow-rumped Warblers flycatching along the Somass Estuary. 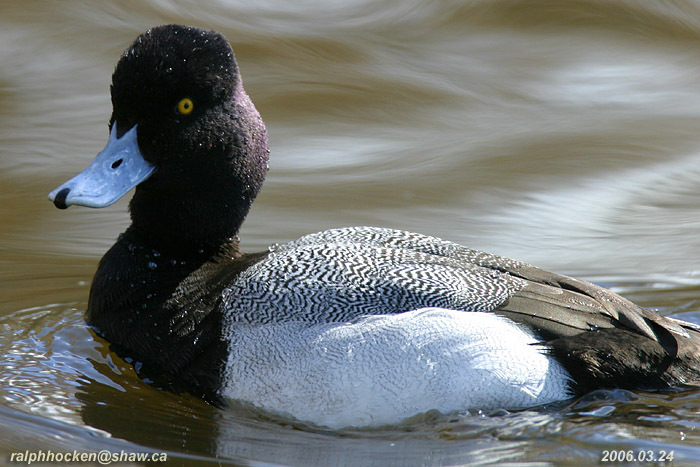 A large flock of Lesser Scaup and Ring-necked Ducks were on the sewage ponds. We saw a Northern Shrike four different times during the morning. Two Western Grebe greeted us on the Alberni Inlet at the end of the walk. The Tuesday morning birders would like to say a special thanks to Sandy McRuer for guiding us--it turned out to be a marvelous morning of birding! The Tuesday bird walk on February 26, 2013 will be going to the Shelly Road side of the Englishman River Estuary in Parksville. 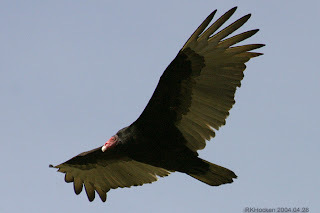 Turkey Vulture: Ralph Hocken photo. The Sunday bird walk went to Nanoose Bay. The morning was clear with calm winds. The highlights included seeing the first Turkey Vulture that the Birdwalk has seen this season soaring high up in the sky. 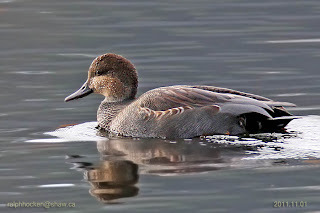 We saw three Eurasian Widgeon on the estuary. Large numbers of Greater Scaup, Scurf Scoters and White-winged Scoters were on the water. Canada Goose, Eurasian Wigeon, American Wigeon, Mallard, Gadwall, Greater Scaup, Northern Pintail, Green-winged Teal, Surf Scoter, White-winged Scoter, Black Scoter, Bufflehead, Common Goldeneye, Barrow's Goldeneye, Red-breasted Merganser, Horned Grebe, Great Blue Heron, Steller’s Jay, Northwestern Crow, Pacific Loon, Common Loon, Bald Eagle, Red-tailed Hawk, Turkey Vulture, Northern Shrike, Chestnut-backed Chickadee, Killdeer, Mew Gull, Thayer’s Gull, California Gull, Glaucous-winged Gull, Downy Woodpecker, American Robin, Varied Thrush, Spotted Towhee, Song Sparrow, Red Crossbills, House Finch, Red-winged Blackbird and Pine Siskin. The Citrine Wagtail has been seen again in Courtenay. One hundred and twenty Brant were seen at Rathtrevor Provincial Park in Parksville. A Northern Pygmy Owl was seen in Yellow Point south of Nanaimo. The Tuesday bird walk went to Rathtrevor Provincial Park in Parksville. The morning was cloudy with a few light showers throughout the morning. A large mixed flock of Black-bellied Plovers, Black Turnstones, Dunlin and two Black Oystercatchers greeted us at the tide line as the bird walk began. The large flock lifted several times giving us great views as the huge cloud of shorebirds danced over the water. The big surprise of the morning was the sighting of a Northern Goshawk that passed overhead and then disappeared into the forest. Flock after flock of Common Murre flew down the Strait of Georgia just above the water for most of the morning. Four Pine Grosbeaks were spotted feeding on the buds on an apple tree not far from the trail near the old homestead. Bald Eagle, Northern Goshawk, Black-bellied Plover, Black Turnstone, Dunlin, Black Oystercatcher, Mew Gull, Thayer's Gull, Glaucous-winged Gull, Northwestern Crow, Common Raven, Pacific Wren, American Robin, European Starling, Chestnut-backed Chickadee, Spotted Towhee, Pine Grosbeak, Song Sparrow, Dark-eyed Junco and Pine Grosbeak. A Turkey Vulture was seen over Turner and Uplands Road in Nanaimo. Twelve Cedar Waxwings were seen along the Long Lake Trail in Nanaimo. Guest speaker will be Ramona de Graff. Her talk "Forage Fish" All are welcome. For more info phone 250-752-7588. The Tuesday bird walk on February 19, 2013 will be going to Port Alberni. Sandy McRuer will meet us at Victoria Quay in Port Alberni at 9:00 a.m.
We will go onto the Somass Estuary for the bird walk. The Sunday Bird Walk on February 24, 2013, will be going to Buttertubs Marsh in Nanaimo. We will meet at the bird store at 9:00 a.m. or at the parking area at Buttertubs Marsh off Bowen Road in Nanaimo at about 9:15 A.M.
Pine Grosbeak: John Purves Photo. The Tuesday bird walk went to Rathtrevor Provincial Park in Parksville. The morning was cloudy with a few light showers throughout the morning. A large mixed flock of Black-bellied Plovers, Black Turnstones, Dunlin and two Black Oystercatchers greeted us at the tide line as the birdwalk began . The large flock lifted several times giving us great views as the huge cloud of shorebirds danced over the water. The big surprise of the morning was the sighting of a Northern Goshawk that passed overhead and then disappeared into the forest. Flock after flock of Common Murre flew down the Strait of Georgia just above the water for most of the morning. Four Pine Grosbeaks were spotted feeding on the buds on an apple tree not far from the trail near the old homestead. The next Tuesday bird walk on February 19, 2013 will be going to Port Alberni. Sandy will meet us at Victoria Quay in Port Alberni at 9:00 a.m. The Sunday bird walk went to Columbia Beach. The morning was cloudy with calm winds. 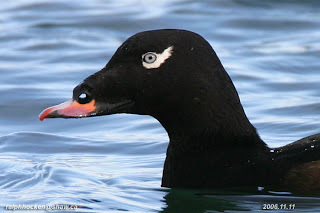 We saw large numbers of Surf Scoters, White-winged Scoters and one Black Scoter and Long-tailed Duck on the Strait of Georgia. A large number of Pacific Loons were seen further offshore. Mew Gull, Thayer's Gull, Glaucous-winged Gull, Common Murre, Eurasian-collared Dove, Northern Flicker, Northwestern Crow, Chestnut-backed Chickadee, American Robin, European Starling, Spotted Towhee, Song Sparrow, White-crowned Sparrow, Golden-crowned Sparrow, Dark-eyed Junco, House Finch and Pine Siskin. A Northern Shrike was seen in a backyard along Meridian Way in Parksville. the morning. Surf Scoters and White-winged Scoters were plenty-full on the water. Three Cackling Geese were seen at the Morningstar Ponds at French Creek. Everyone is invited to attend the Nanoose Naturalists’ Thursday, February 14 meeting where we will hear a presentation “Alpine Plants of BC” by Andy MacKinnon (co-author of Native Plants of BC). Arrive before 7 pm to the Nanoose Library Hall. Admission by donation. Call Margot @ 250-468-9167. The Tuesday bird walk will be going to Rathtrevor Provincial Park in Parksville on Tuesday, February 12, 2013. We will meet at Parksville Community Park at the Lion’s Playground at 9:00, p.m. or at the main parking lot at Rathtrevor, at about 9:10 a.m. 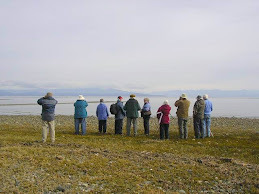 The Sunday Bird Walk on February 17, 2013, will be going to Nanoose Bay. 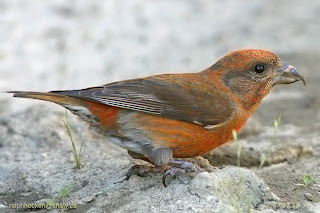 We will meet at the bird store at 9:00 a.m. or at the parking area behind the church camp off highway 19 and Arlington Road at about 9:15 A.M.
A local birder has just returned from a vacation in the Baja and has recommended the following website for some fascinating birding.. The Tuesday bird walk went to Deep Bay. The morning was cloudy with rain showers and a strong wind off the Strait of Georgia. 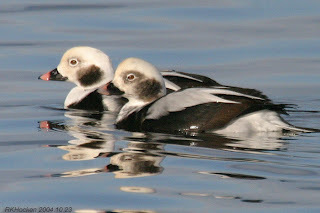 The highlights included seeing Long-tailed Ducks in their usual spot just off shore at the point (we have decided to call it the Long-tail Point). We saw and heard the Black Scoters singing through-out the morning. Surf Scoters and White-winged Scoters were plenty-full on the water. A Sharp-shinned Hawk was perched high up in a tree, giving us great views. The next Tuesday bird walk on February 12th will be going to Rathtrevor Provincial Park. The Sunday bird walk went to Neck Point Park in Nanaimo. The morning was cloudy with calm winds. We spotted a Brandt’s Cormorant on the Strait of Georgia. A large flock of Red Crossbills flew into a tall conifer tree and started feeding on the acorns, giving us good views of them. Canada Geese, Mallard, Bufflehead, Harlequin Duck, Common Goldeneye, Red-necked Grebe, Horned Grebe, Pacific Loon, Common Loon, Brandt’s Cormorant, Double-crested Cormorant, Pelagic Cormorant, Surf Scoter, Red-breasted Merganser, Black Oystercatcher, Spotted Sandpiper, Marbled Murrelet, Bald Eagle, Thayer’s Gull, Glaucous-winged Gull, Common Raven, Chestnut-backed Chickadee, Anna’s Hummingbird, Brown Creeper, Red-breasted Nuthatch, Pacific Wren, Bewick's Wren, Golden-crowned Kinglet, American Robin, Spotted Towhee, Song Sparrow, Fox Sparrow and Red Crossbill. A Palm Warbler and a Western Meadowlark were seen at the Nanaimo River Estuary in south Nanaimo. Fifty Evening Grosbeaks were seen along Bob-O-Link Way in Nanaimo. The Tuesday bird walk went to the Little Qualicum River Estuary in Qualicum Beach. The morning was cloudy but quite warm. The highlights included seeing five Long-tailed Ducks, hundreds of Red-necked Grebes and many Horned Grebes off shore from the viewing platform off Highway 19A. A large flock of Black Scoters were seen not far from shore at the estuary. Further off shore were thousands of Common Murre on the water. “ Rare Bird Alert Arctic Loon”----- We found an Arctic Loon feeding near the far shore at the mouth of the Little Qualicum River. We watched the Loon for thirty minutes (11:20 until 11:50 a.m.) through our scopes. The adult, non-breeding Loon displayed a dark nape with white cheeks, and extensive bright white tuft along its flank. The Arctic Loon was smaller than the Common Loon that swam near it. We used The Sibley Guide to Birds, page 24, first edition, published October 2000 to confirm the identification of the Arctic Loon. Common Merganser, Red-breasted Merganser, Pacific Loon, Common Loon, Arctic Loon, Horned Grebe, Red-necked Grebe, Double-crested Cormorant, Pelagic Cormorant, Great Blue Heron, Bald Eagle, Black-bellied Plover , Black Turnstone, Dunlin, Mew Gull, California Gull, Western Gull, Thayer's Gull, Glaucous-winged Gull, Common Murre, Belted Kingfisher, Northern Flicker, Northwestern Crow, Common Raven, Chestnut-backed Chickadee, European Starling, Spotted Towhee, Song Sparrow, Golden-crowned Sparrow, Dark-eyed Junco, Red-winged Blackbird, Purple Finch, House Finch and House Sparrow. The Tuesday bird walk will be going to Deep Bay on Tuesday, February 05, 2013. We will meet at Parksville Community Park at the Lion’s Playground at 9:00, p.m. or at the Deep Bay Marine near the café, at about 9:35 a.m.